It was sad to wake up to the news Friday morning that B.B. King had passed away during the night. Not that it was unexpected: after he cancelled his tour last fall, then went on hospice care a few weeks ago, we knew the end was near. But it makes you feel blue to lose a hero. Riley B. King was a pioneer in electric blues. He had the purest tone of any guitarist I have ever heard. He had a smooth, flowing style of playing, and could say more in two notes than many guitarists can say in thousands (and I said that before Lenny Kravitz did!). He helped to bring a beautiful ethnic art form to millions around the world. This white boy is very grateful for the blues. But he also provided some valuable leadership lessons to us through his music and his work with other musicians. Let’s look at what seems significant to me. First, and foremost, B.B. was an example of collaborative leadership. In concert, he frequently played with other guitarists who idolize him. 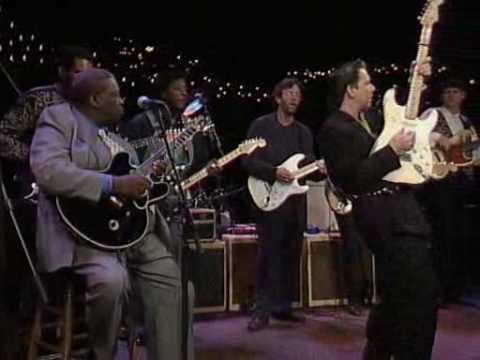 If you have ever watched a group of blues guitarists play together, it is a tremendous show of collaboration. Each plays in a different register, and they defer to each other as they take their solos. In these situations, the respect everyone had for B.B. was obvious. They deferred to him, but he gave it right back. He played with everybody and looked like he enjoyed doing it. In these group situations, he did not demand the spotlight: he shared it. Frequently the solo of another guitarist received an immediate compliment from him. That’s another good lesson! Second, B.B. was not ego-driven. He was frequently introduced as the King of the Blues, but he didn’t let it go to his head. He said: “I just wonder where I was when the talent was being given out, like George Benson, Kenny Burrell, Eric Clapton… oh, there’s many more! I wouldn’t want to be like them, you understand, but I’d like to be equal, if you will.” But Jimmy Vaughan said that B.B. was the guitarist they were all trying to sound like – without success. Frequently during his shows, he would ask for the audience’s permission to solo: “Can I play Lucille now?” That doesn’t sound like a proud musician. Third, he was an outstanding mentor. 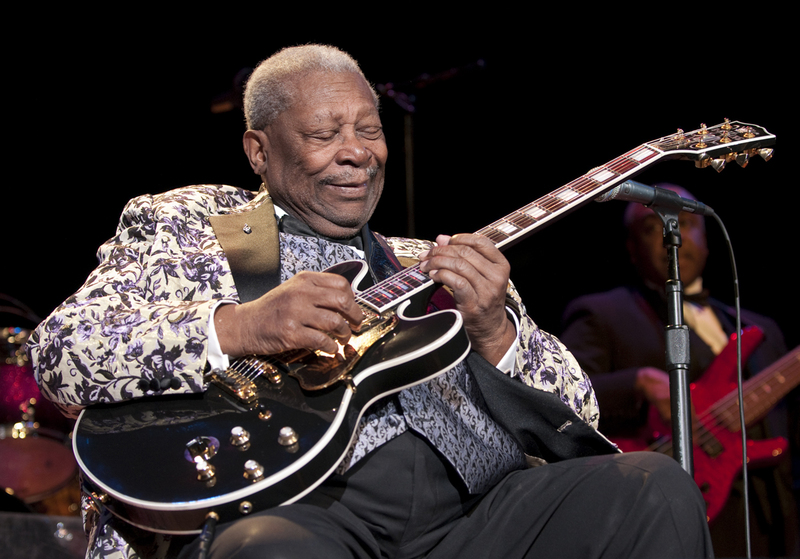 He loved playing with young musicians and did all he could to encourage the next generation of blues artists. He gladly shared the spotlight with them. Many experienced leaders could stand to learn from that example. Fourth, like most blues musicians of his era, he worked hard in order to make it, and worked hard even after he had made it. During one year in the early sixties, he played 340 one-night stands! He developed his talents and worked around his weaknesses, and achieved mastery of his art. He once said “It seems like I always had to work harder than other people. Those nights when everybody else is asleep, and you sit in your room trying to play scales.” He didn’t take his talents for granted. In spite of it all, he maintained a sense of humor, and he used his music to bring people of all races together. And that is the magic of good music: it has the power to unite humanity. Even though I never saw B.B. King in person, and was not privileged to meet the great man, he touched my life in many ways. I will always be grateful for the music he added to the soundtrack of my life, and for the lessons he taught me. Better Not Look Down. Jennings, Will and Sample, Joe. © Universal Music Publishing Group. This entry was posted in B.B. King, blues, Leadership, Tribute and tagged B.B. King, blues, collaboration, leadership, learning, mentor, music, respect, work ethic by 2thdocbob. Bookmark the permalink.